New York is a state with a long and storied history of earthquake activity that has touched all parts of the state. 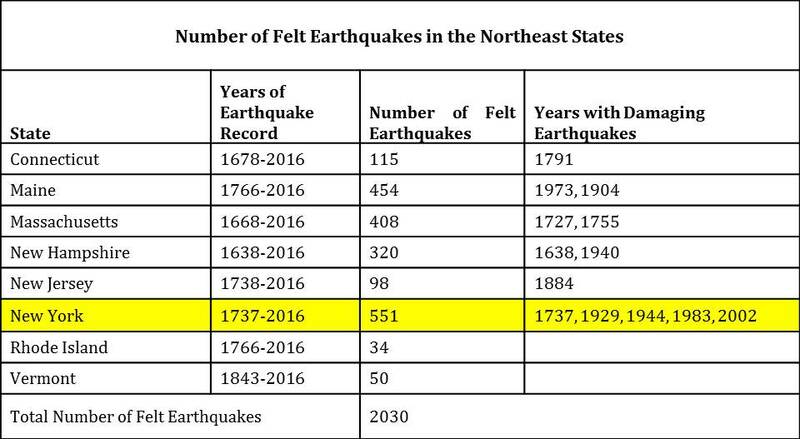 Since the first earthquake that probably took place on December 19, 1737, New York has had over 550 earthquakes centered within its state boundaries through 2016. It also has experienced strong ground shaking from earthquakes centered in nearby U.S. states and Canadian provinces. Most of the earthquakes in New York have taken place in the greater New York City area, in the Adirondack Mountains region, and in the western part of the state. The largest earthquake centered in New York took place on September 5, 1944. With a magnitude of 5.9 and an epicenter beneath the New York-Canada border, this earthquake did major damage in the towns of Massena, NY and Cornwall, Ontario. In Massena a school gymnasium suffered major damage, 90% of the chimneys were destroyed or damaged, and house foundations were cracked, windows were broken, and plumbing was damaged. Similar kinds of damage were reported at Cornwall, Ontario. This earthquake was felt from eastern Maine to central Michigan and to Maryland. An earthquake of magnitude 5.2 on August 12, 1929, was centered in western New York near the town of Attica. In Attica many chimneys were thrown down, brick walls were cracked, and the aisles of stores were littered with goods thrown from the shelves. This earthquake was felt as far east as central New Hampshire and as far west as Cleveland, Ohio. Subsequent to this earthquake, shakes that were notable in the Attica area but caused little or no damage took place on August 15, 1955, July 16, 1965 and January 1, 1966. The New York City area has experienced two damaging local earthquakes during its history. The first, about 10:30 p.m. on December 18, 1737, damaged some chimneys in the city. A local magnitude of 5.2 has been assigned to this earthquake and its epicenter is poorly known. On the other hand, the second was a well-studied earthquake that occurred on August 10, 1884. This earthquake caused scattered incidents of cracked chimneys and plaster, broken windows, and objects thrown from shelves throughout New York City and surrounding towns in New York and New Jersey. The shaking from this earthquake was felt as far west as Toledo, Ohio and as far east as Penobscot Bay, Maine. It was also reported felt by some in Baltimore, Maryland. The local magnitude of this earthquake has been set at 5.2. 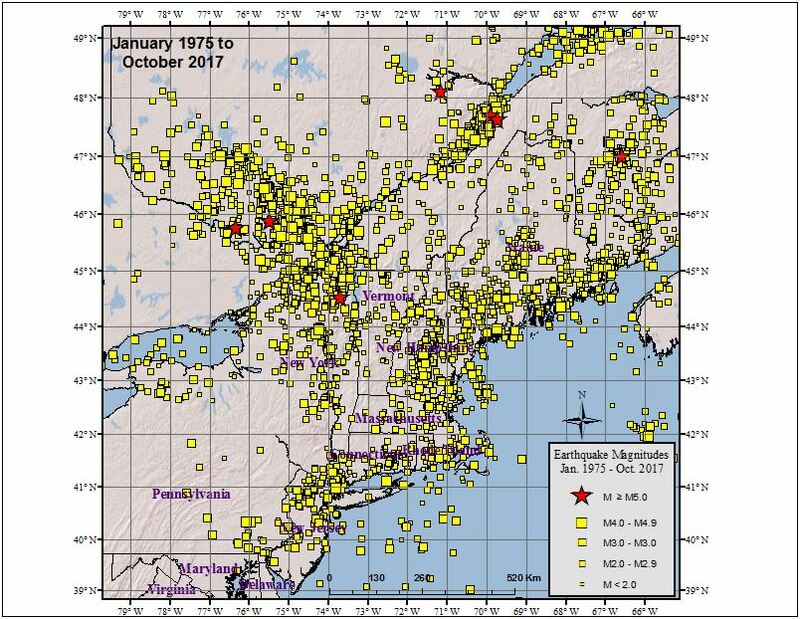 A number of small earthquakes have been centered in the New York City area, including as recently as October 27, 2001 when a magnitude 2.6 event occurred at 1:42 a.m. beneath Manhattan Island. Northern New York has had several damaging earthquakes centered in that part of the state. A magnitude 5.0 earthquake on April 20, 2002 caused damaged chimneys, slumps of road embankments, and other minor damage in the Au Sable Forks area. A magnitude 4.7 earthquake centered near Goodnow also damaged some chimneys, as did a similar magnitude event on April 20, 1931 at Lake George. Some other notable earthquakes in northern New York that did no damage were on March 12, 1853, January 5, 1916, March 18, 1928, April 15, 1934, November 6, 1951, May 23, 1971, July 15, 1973, and November 3, 1975. Several strong earthquakes centered outside of New York were felt strongly but caused no reported damage in the state. The strongest of these events was the magnitude 7.5 earthquake centered at Charlevoix, Quebec on February 5, 1663, the magnitude 6.2 earthquake centered in western Quebec on November 1, 1935, the magnitude 6.2 earthquake centered at Charlevoix, Quebec on March 1, 1925, the magnitude 5.9 earthquake centered at Mineral, VA on August 23, 2011, and the magnitude 5.8 earthquake centered near Montreal on September 6, 1732.